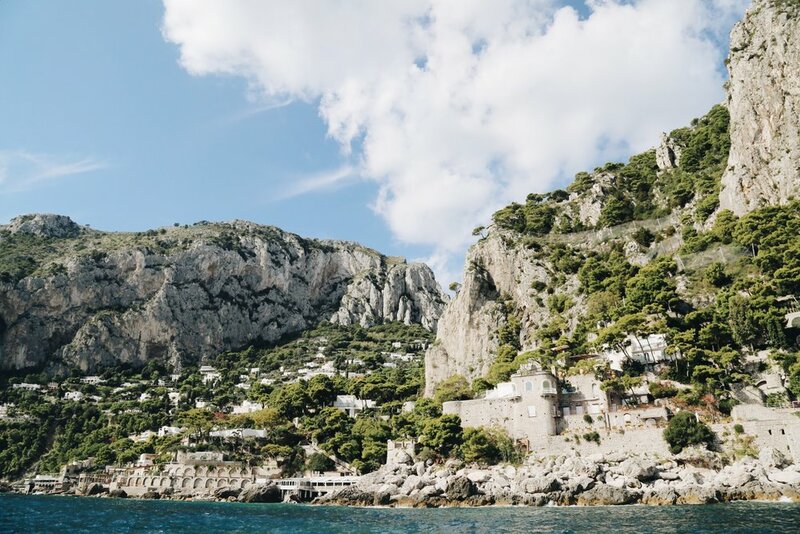 The journey to Capri commenced in Naples. 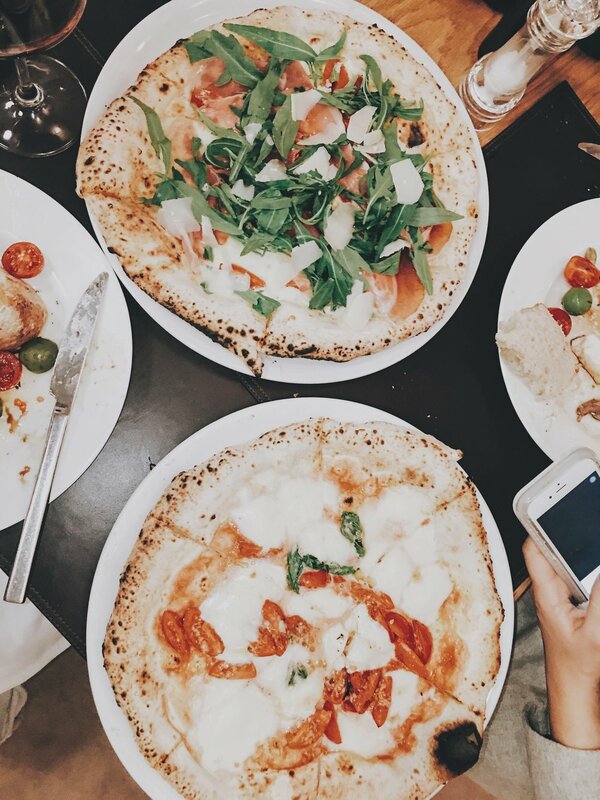 So, naturally, our first stop was for pizza, recommended to us by our taxi driver - think Eat. Pray. Love. We arrived at night so upon awakening, I was confronted with Mt. Vesuvius in the distance and the richly colored roofs that scattered as far as the eye could see. I can say I've never felt unsafe while traveling but on subways and ferries many advise you to be excessively cautious. 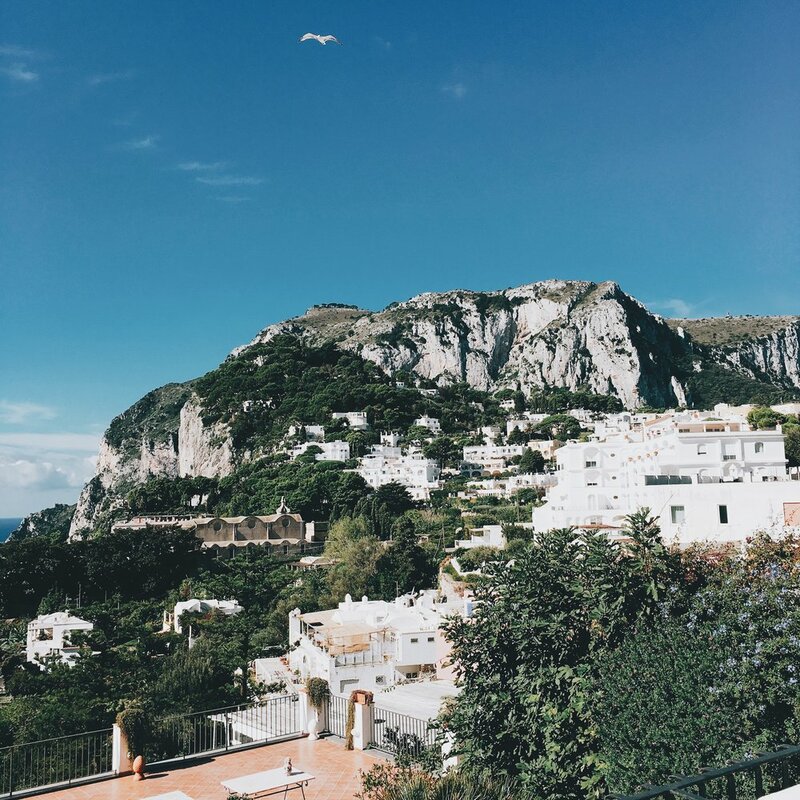 So, after obsessively clutching my belongings while getting on and off the ferry and on top of an extremely rough ride full of individuals with horrible sea legs, I was thrilled to arrive in Capri. Only to our delight, it began pouring down rain. Because our hotel was tucked away from it all, we had to seek shelter under the umbrellas of a little marina café until the rain subsided. 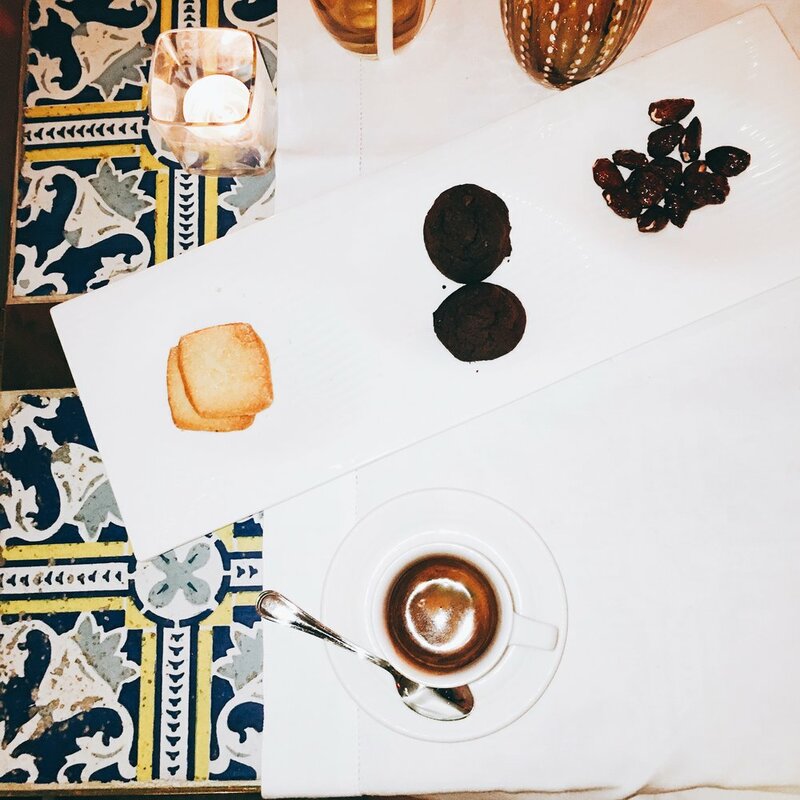 We sipped on Spanish coffees until we were able to take a taxi as far as it could go and then began to hike the rest of the way to La Scalinatella Hotel. 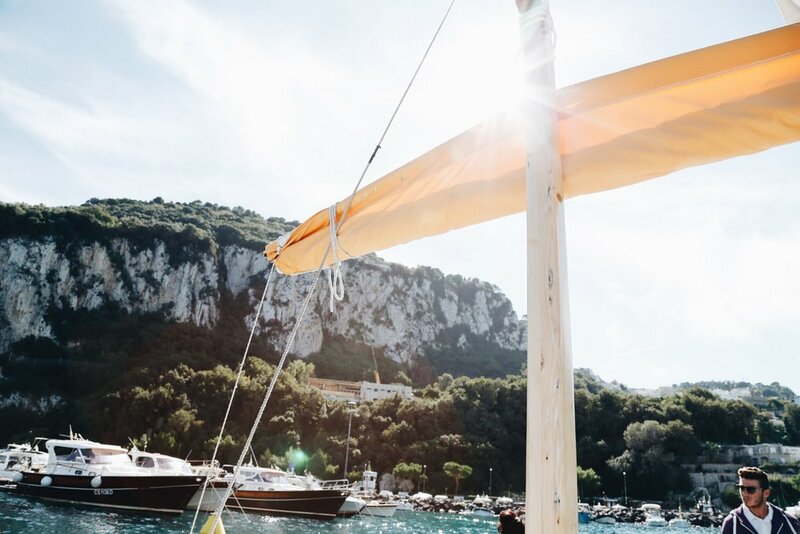 The idyllic navy-and-white color scheme of Capri was highlighted throughout our cozy boutique hotel, with two infinity pools and sprawling views of the lush green hills. 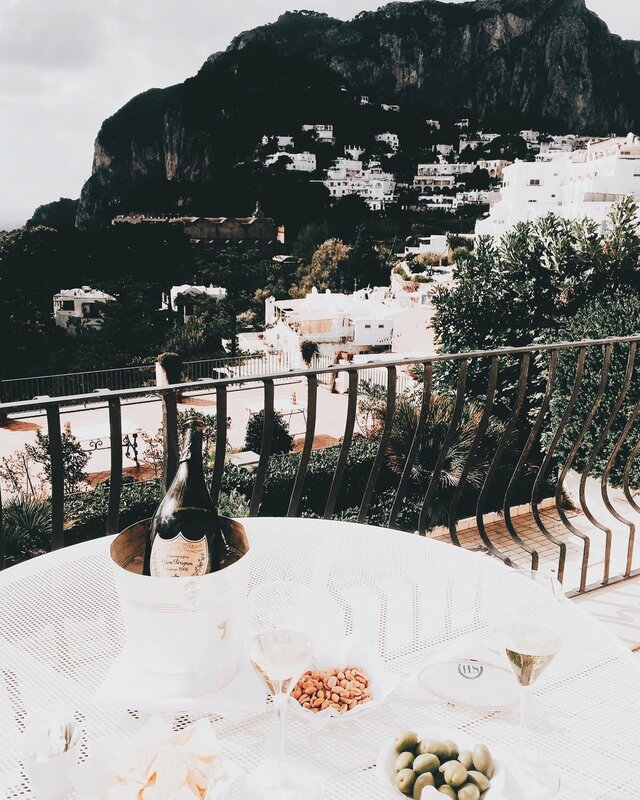 We popped some champagne and relaxed on our balcony until dinner at Villa Margherita where the lemon fettuccine with shrimp sent me to nirvana. In the morning, we headed back down to the marina where we had a boat waiting to cruise around the island. 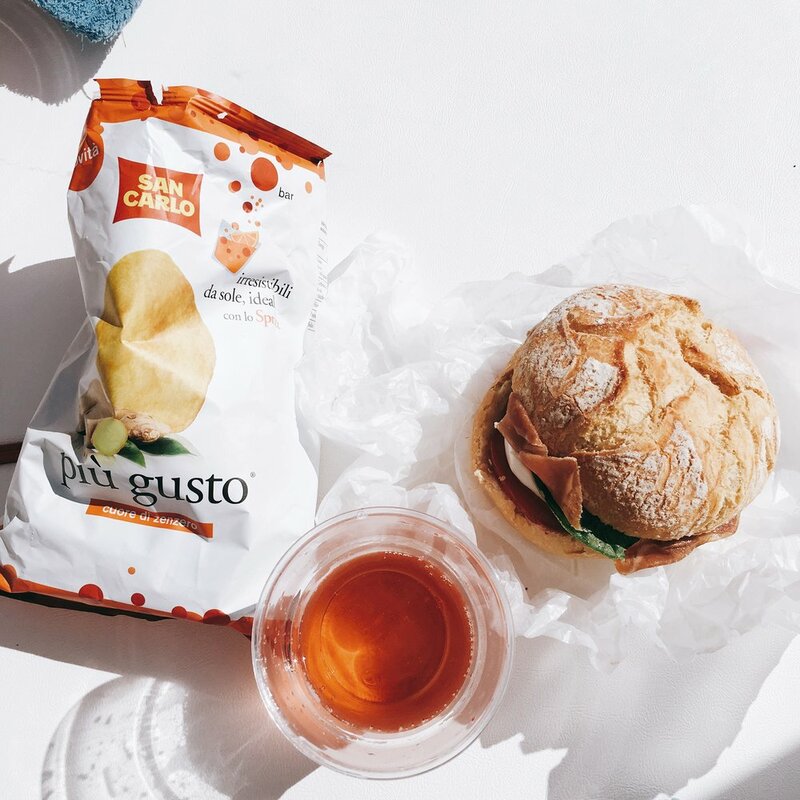 We stocked up on fresh prosciutto and mozzarella sandwiches, ginger potato chips (unusually divine), rosé and local limoncello from a makeshift convenient store we discovered in the back of a café. 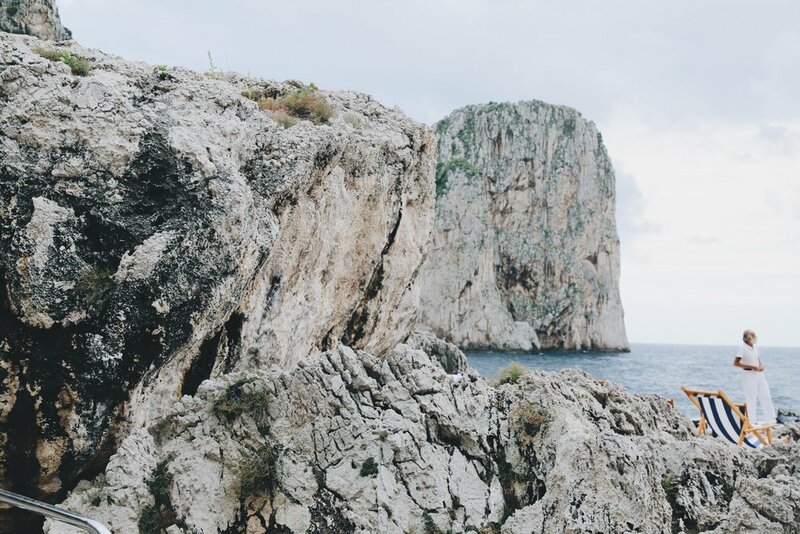 It's essential to boat through the skyscraping Faraglioni rock stacks, but we got unusually lucky with our experience at the Blue Grotto. 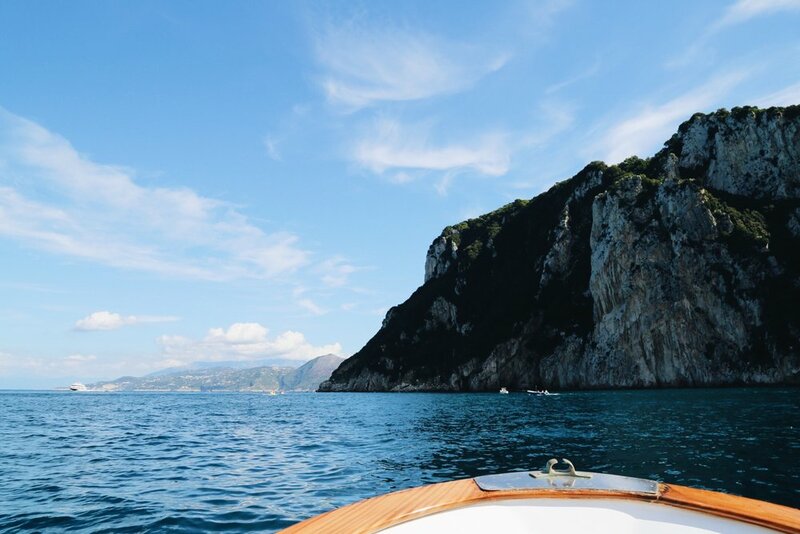 During peak season, dozens of rowboats squeeze there way under the tiny opening in the cave. With few souls in sight we were able to dive right in ourselves. Once within the dim walls, the water we effortlessly floated in reflected rays of light that illuminated the entire cavern bright blue. Afterwards we traveled further up and around the expansive staggered cliffs covered in pine trees, other foliage and villages sprinkled with white abodes. Tipsy and tired from a long day on the water, we sat down at Le Camerelle, a restaurant we had to try because of the name’s close resemblance to mine, Camryn Elle. Also because the delightful mosaic tiled tables and chic booths were hard to pass up. 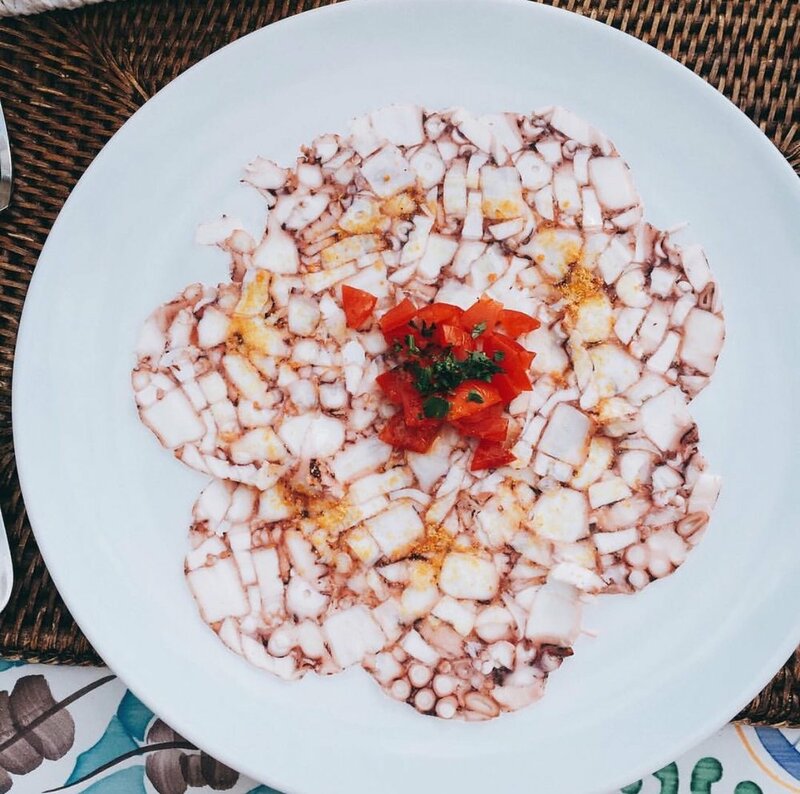 The Caprese salad (translating to Salad of Capri), octopus carpaccio and veal scaloppine brought us back to life. Dessert at Gelateria Buonocore led us to a small perfumery where we purchased the yummiest smelling fragrance. 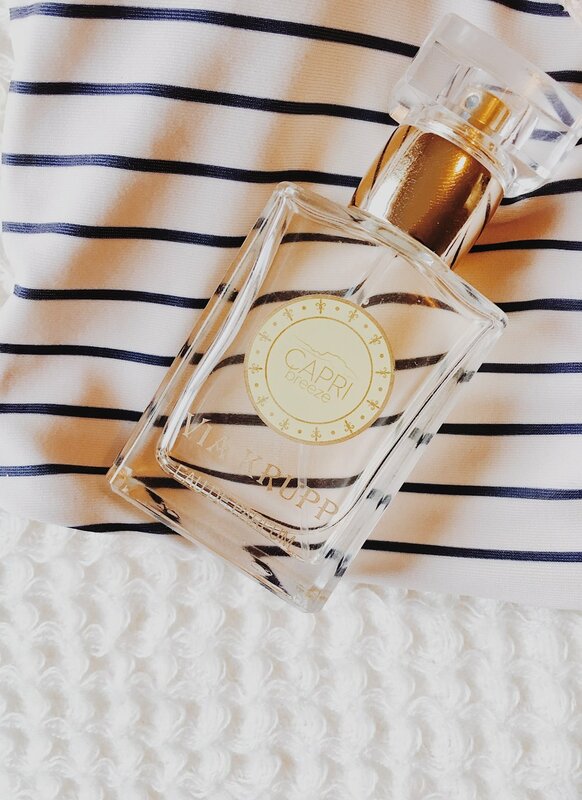 With base notes of vanilla and vetiver (a calming and grounding oil from a plant found in India) heart notes of jasmine and lily of the valley and top notes of peach and coconut - it was basically Capri in a bottle. 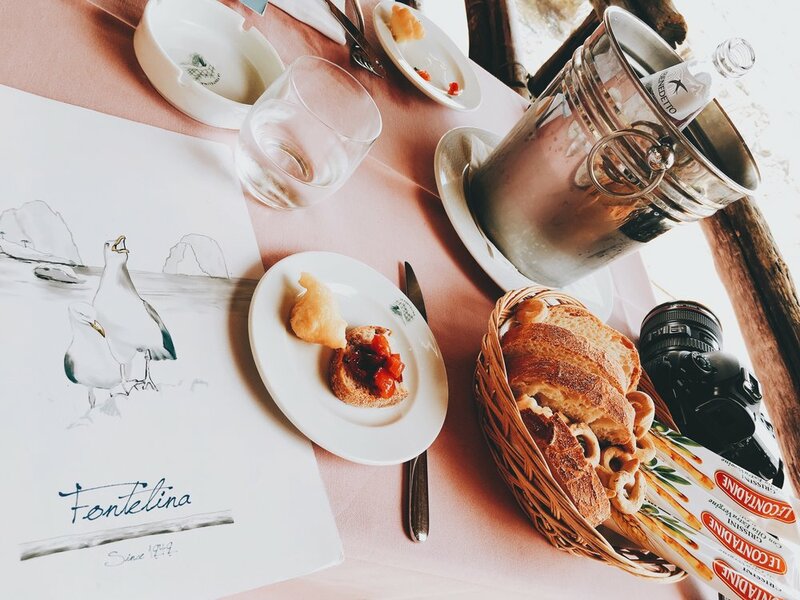 By day two, a beach club was calling our name, La Fontelina is known for its sea of nautical umbrellas with matching chairs that cover the rocks during the summer. Though we experienced a much different vibe, the serenity was wonderful nonetheless. 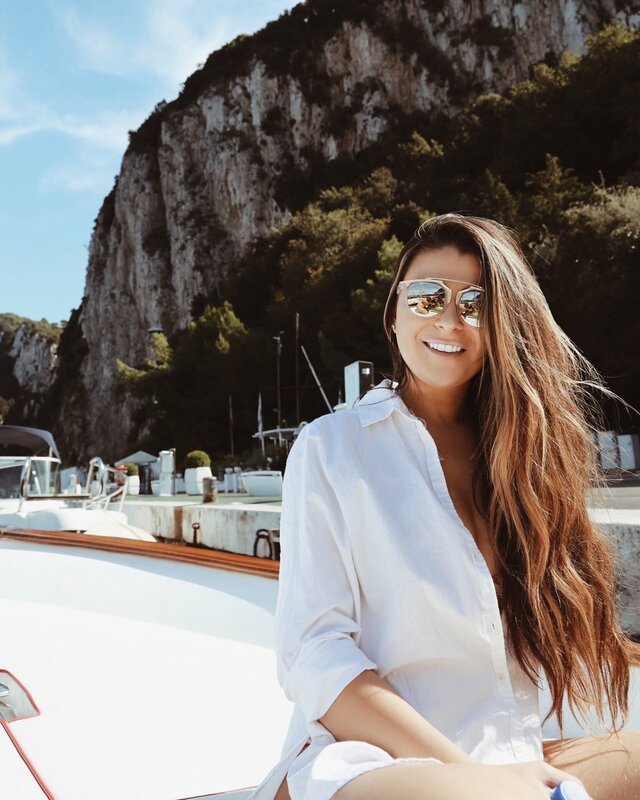 A long, winding path around the rocks brought us down to the water and led us to this prime location. 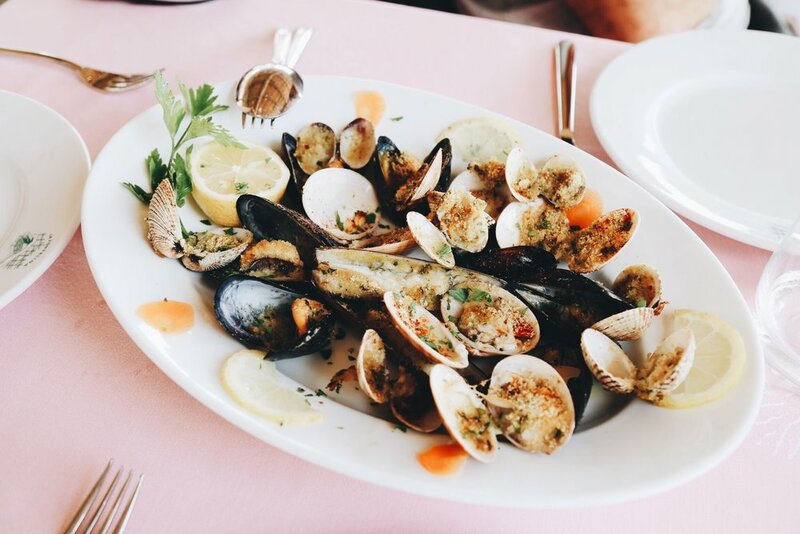 We started with lunch: an appetizer of clams, mussels and razor clams baked with breadcrumbs, then we devoured crab pappardelle and their unrivaled seafood linguine. After licking the plates clean we took the few steps down to the beach club and sipped on Sangria for the rest of the day. 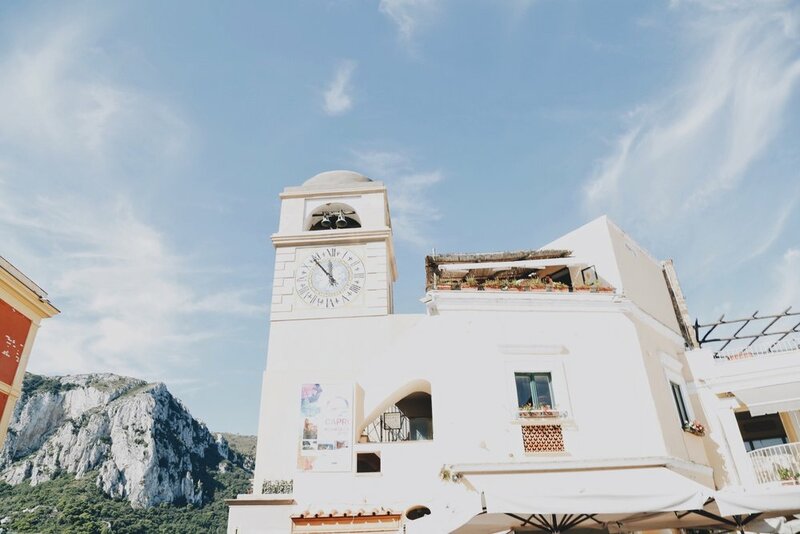 On our last day in Capri, we checked out of our hotel and shuffled up the stairs of the clock-tower in the middle of the main plaza to Pulalli Wine Bar for Happy Hour. 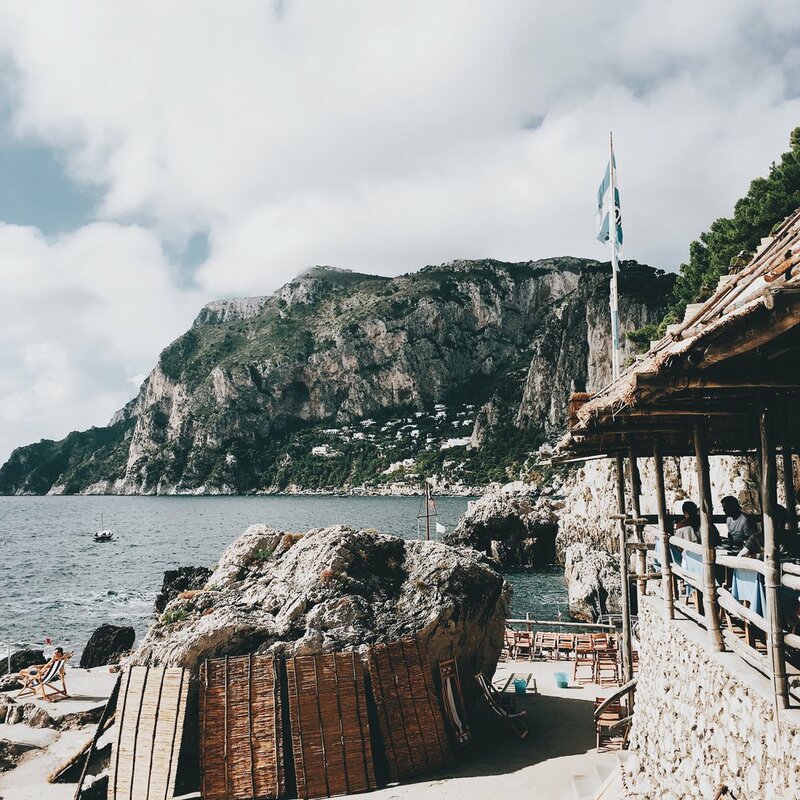 Seated outside on our own private balcony overlooking the entire island, we sipped on rosé and a bite size appetizer sampler of fried Italian goodness. Brooke and I wandered into town to Ristorante Pizza Aurora for dinner and people watching. 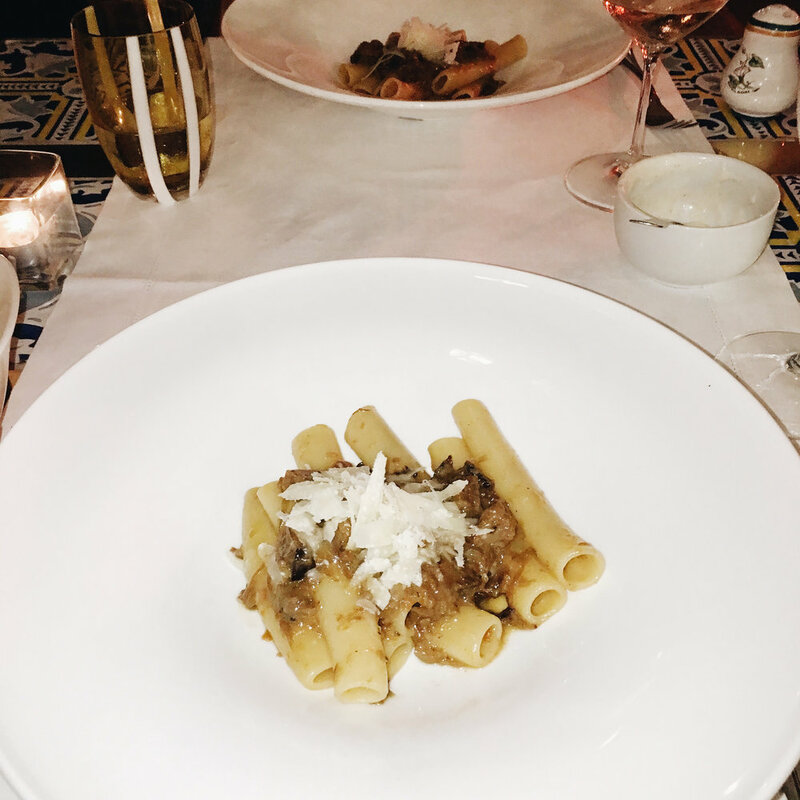 We dined on pasta e fagioli soup, a Caesar salad, paccheri with white Bolognese, the crispiest Margherita pizza with anchovies, and we couldn't go without an expresso and cookies for dessert. 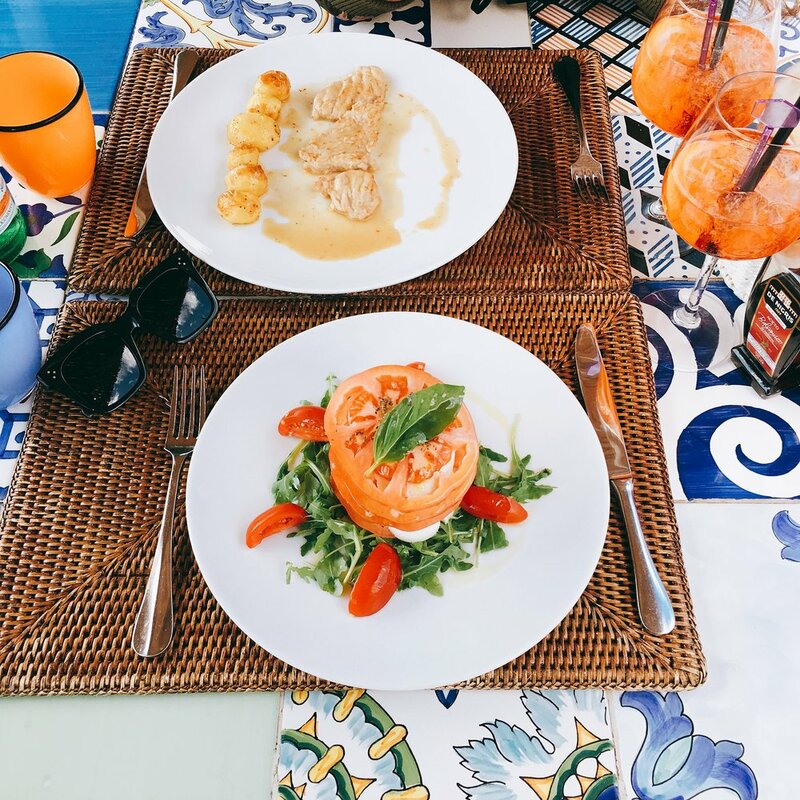 Lemon risotto at Pulalli Wine Bar in Capri on their private balcony and the seafood linguine at La Fontelina follow with sangria at the beach club. La Margherita, Aurora, Gelateria Buonocore, Le Camerelle, Lo Zodiaco, L'Olivo. ≫ STILL WANT MORE ?